The Remorino brothers & Tony Dawkins head off to the Malta Darts Open! 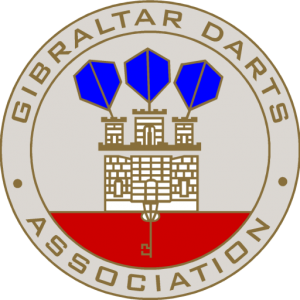 Tony Dawkins, Johnny Remorino and Francis Remorino will be heading off to the 2017 Malta International Darts Open, the event takes place from the 14th to the 16th of November and the three players will be representing Gibraltar during the week. The GDA wishes them a safe trip and the best of luck! 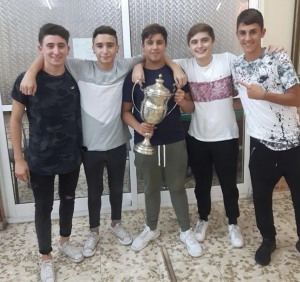 Mons Calpe Youngsters make history with Friendship Cup glory! Friday 27th October saw the ever popular GDA Friendship Cup which dates back to 1979. The trophy was donated by Mr. Bill Gibson, the Leicestershire (UK) secretary & brought to Gibraltar by Mr Dicky McCarthy (then GDA secretary) & Mr. John Trinidad. A five-man team from St. Theresa’s Social Club were the first ever winners. This year’s tournament saw a great turnout of 50 players, forming 10 teams of 5. The event is played as 5 singles matches (best of 3). It proved to be a fun night played in a great atmosphere. In the preliminary round Mons Calpe ‘B’ beat BMW ‘B’ 4-1 and Visca Catalunya beat Varyl Begg 3-2. 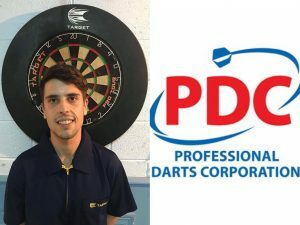 Jarvis Bautista is ready for his PDC Under 23 World Championship debut! Jarvis Bautista will be playing amongst the Worlds top 64 qualifiers at this years PDC Under 23 World Championships. Jarvis earned his spot by defeating 2x Gib Open Youth winner Jeremy Cruz in the final. The final took place during the PDC Gibraltar Darts Trophy on the main stage back in May. Jarvis has had some other good runs this season, his highlight was making the semi finals of the Gibraltar National Championship. Jarvis will be traveling over to Wigan (UK) accompanied by GDA Youth Chairman and GDA Vice President Alex Nuñez on the 3rd of November, Jarvis will make the most of the development tournaments on the Saturday and Sunday before making his debut at the World Championships on Monday the 6th of November 2017. We would also like to thank Tommy Cox from the PDC who was instrumental in achieving this place for us. The GDA wishes Jarvis the best of luck! Dyson Parody claims the Johnny Neale title once again! The Johnny Neale Charity Singles event took place at the Varyl Begg Social Club on the 24th of October with a great turnout of 34 players. The competition dedicated to the local legend enjoyed a high standard of play throughout the night. Dyson managed to overcome some tough opposition to make his way to the final. In the final he managed to get the better of Justin Broton with a 2-1 win in the deciding leg. Congratulations to Dyson Parody and commiserations to Justin Broton! Gibraltar Youths in Bridlington Week Review! On the 22nd of September Gibraltar’s top youth players headed off to Bridlington,UK. Craig Galliano returned for a second year by retaining the league local title. National Champion Justin Hewitt made his much anticipated debut alongside other top youth players which included Jerome Chipol, Ethan Smith and Sean Negrette. Joseph Ward also joined in for the open events. Our boys threw exceptionally well all week. On the first day at the men’s British Classic Ethan Smith managed to pass two rounds. This was mainly to his brilliant display of finishing under pressure. On day one we also saw Justin Hewitt take on a top competitor in Daniel Ayres. Young Hewitt didn’t make things easy for Ayres, after a brilliant display of scoring keeping him under immense pressure, and not giving any legs away easily. 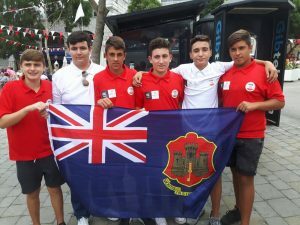 Gibraltar’s top Youth & Senior players head off to the World Masters! This coming Friday a total of 5 Seniors and 5 Youth players will be travelling to Bridlington in the UK to take part in a series of events. The team will travel on the 22nd and they will return on the 29th of September. 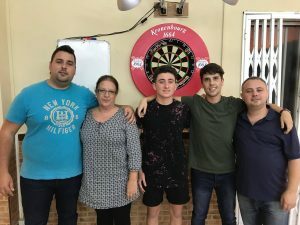 Gibraltar’s top players will start the week playing in the British Open and British Classic events, later on during the week they will take part in the two most prestigious events of the calendar year which is the World Championships and the Winmau World Masters. In the men’s competitions we have National Champion Dyson Parody, Dylan Duo, Antony Lopez, Justin Broton and debutant at the World Masters Keith Medhurst taking part. From the Youth section we have a healthy selection of players attending this year after the academy managed to increase the players attending from Gibraltar from 1 to 5 entries. This is a record attendance for Youth Gibraltarians attending this event. With Justin Hewitt as National Champion, Craig Galliano as the League Winner, Ethan Smith as Best of the rest event Champion, also accompanied by Sean Negrette and Jerome Duarte as Youth Ranking event winners. The GDA wishes them a safe journey and the best of luck! 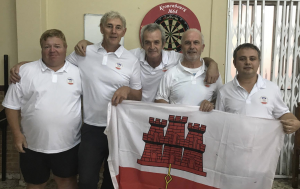 The Gibraltar Darts Team prepare for the World Cup in Japan! With less than three weeks to g o until the start of the WDF World Cup, the Gibraltar team are looking forward to this massive event. Ignoring the 12 hour flight, there is the thrill, excitement and challenge of playing the best darts teams in the world. The event starts on Tuesday 3rd October in Kobe, a city that is mostly remembered for the devastating earthquake of 1995, when more than 6,000 people lost their lives. The city has been rebuilt over the last 22 years, and now welcomes players in various top sporting events, of which the Darts World Cup is only the latest. The Gibraltar team of George Federico, Justin Broton, Manolo Vilerio & Tony Dawkins, with team manager Darren Olivero will be aiming to at least equal the recent success of the youth team who did so well in the Europe Cup. We might be a small nation, but we are aiming high! Good Luck to the Gibraltar Team and safe travels! 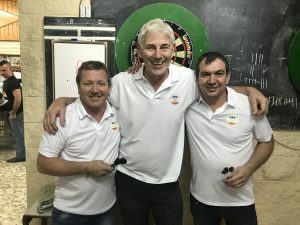 Confident Dylan Duo takes first Darts Trophy of the Season! 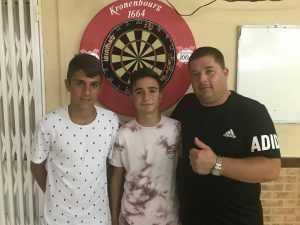 Despite the heat at the Varyl Begg Club, 27 enthusiastic darts players competed for the title of National Day Champion last Wednesday (6th September). The evening was memorable, not only for Dylan’s consistently strong performance, but also for the continued improvement and excellent play of the youth. Dylan had, by far, the hardest draw of the night, defeating Antony Lopez 3-2, Francis Taylor 3-0, David Francis 3-2, and then Justin Hewitt 3-1 to reach the final. He was then up against youngster Craig Galliano who had already beaten Adam Orfila 3-0, Nicholas Gil 3-1, Ethan Smith and Jerome Chipol 3-1. The final surprised many, because, despite playing very well, Dylan was actually outplayed by Craig, who narrowly missed several doubles, including a 158 finish that was millimetres away from the double. Dylan, though, remained composed throughout, and eventually won 3-1. It was a victory through a confidence that comes with age and experience, something that Craig and the other youth players are developing rapidly. 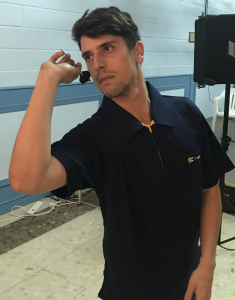 Nine 180’s were hit on the night: 2 each by Dylan Duo, Craig Galliano & Jarvis Bautista, and 1 each by Jerome Chipol, Tony Dawkins & Justin Hewitt. Francis Taylor also hit a very nice 124 checkout to show that some of us oldsters can still do it. Glacis A.S.A vs St. Theresa’s . PLEASE NOTE – This Calendar is provisional and some dates may be subject to change.